The SUV and crossover market has exploded since the turn of the century, with sport utility vehicles now being the largest vehicle market worldwide. Most SUVs are prized for their spaciousness and utility, while others are valued for their fuel economy and practicality. Some SUVs, like Buick SUVs, are especially esteemed for their ability to fit all of the above qualities into a luxury vehicle, while still maintaining a reasonable price tag. Whatever the reason is that you are looking for a new SUV, Buick SUVs are sure to fit that quality. Buick offers three SUVs for the 2019 model year, all with various sizes, safety features and levels of luxury appointments. They are also offering the Regal TourX as a crossover, but the three SUVs – the Encore, the Envision and the Enclave, are the apple of the luxury SUV market’s eye. Below, we will take a look at each of these SUVs and feature just a few of the highlights that each has to offer. When you are done, we invite you to head over to Carl Black Chevrolet Buick GMC in Kennesaw and see any, or all, of these luxury SUVs in person. The smallest of the Buick SUVs is the Buick Encore. It is a crossover designed for superb handling and maneuverability. It features a 1.4 liter 4-cylinder engine capable of 138 horsepower and 148 lb-ft of torque. That type of engine performance is ideal for tooling around urban and suburban Atlanta and Kennesaw. And with an EPA-estimated 33 miles to the gallon on the highway, it is also ideal for those who like to watch what they spend at the gas pump. The 2019 Buick Encore features up to 48 cubic feet of interior space when the rear seats are lowered. This allows this smaller crossover to convert into a moveable storage space for any work or school items that need to be transported. It also features Buick’s QuietTuning system. This unique system uses advanced technology, such as an isolated engine, white noise simulators, thick glass panels, and more, to keep the interior of your Buick isolated from all unwanted outside noise. Between the spacious interior and the QuietTuning technology, the 2019 Buick Encore is quite a comfortable ride. However, Buick didn’t stop there. Among its many safety features, the 2019 Buick Encore also features Front Park assist, Forward Collision Warning, Lane Departure Warning, Rear Park Assist, Stabilitrak and a 5-star safety rating from the NHTSA. All of these safety measures add up to you having even more peace of mind while enjoying the comfortable interior of the 2019 Buick Encore. The newest addition to the family of Buick SUVs is the Buick Envision. It first went on the North American market just three years ago, and it nearly tripled its sales numbers in year number two. This Buick SUV features two different engine options. The first is a 2.5 liter 4-cylinder that gets 197 horsepower and 192 lb-ft of torque. This engine, along with the Encore’s is paired with a six-speed transmission. The other engine option for the 2019 Buick Envision is a 2.0 liter turbo 4-cylinder that gets 252 horsepower and 295 lb-ft of torque. This engine is paired with a 9-speed transmission, for a smoother ride. If you need a little more mmmph under the hood, this turbo engine is much more suited for the acceleration some prefer. This model also has Stop/Start Technology available. What this feature does is effectively turn your 2019 Buick Envision’s engine off in certain situations, such as stoplights. When the driver’s foot is released from the brake pedal, the engine starts back up without the driver having to do anything. This limits the amount of fuel wasted while idling and allows the Envision an impressive 22 miles per gallon in the city and 29 miles per gallon on the highway. The 2019 Buick Envision also features ample capable cargo room, 57.3 cubic feet of it, and Buick’s QuietTuning technology. It also features other safety features, such as Rear Park Assist, Rear Vision Camera, Automated Parking Assist and more. It also features a Hands-Free Liftgate, for when you have your hands full and need to get into the cargo area of the 2019 Buick Envision. The largest of the Buick SUVs is the 2019 Buick Enclave. This mid-sized crossover SUV is also the most powerful, with a 3.6 liter V6 engine that gets 310 horsepower and 266 lb-ft of torque. This engine is also paired with the 9-speed transmission. It offers up to 26 miles per gallon on the highway. It also has a whopping 97.6 cubic feet of available interior cargo space, which is plenty of room for groceries, soccer equipment, school projects and much more. This is where you will see some of the finest luxury appointments and safety features Buick has to offer. Among them are the QuietTuning technology, smartphone integration, wireless charging, Rear Cross Traffic Alert, second Row Heated Seats and so much more. Surround Vision is another feature that provides an “overhead” and 360-degree representation of the vehicle while at lower speeds. This can allow the driver a complete view of what is around the vehicle when trying to get through a crowded parking lot or other congested areas. There is also an available power moonroof, providing scenic views for all possible passengers. 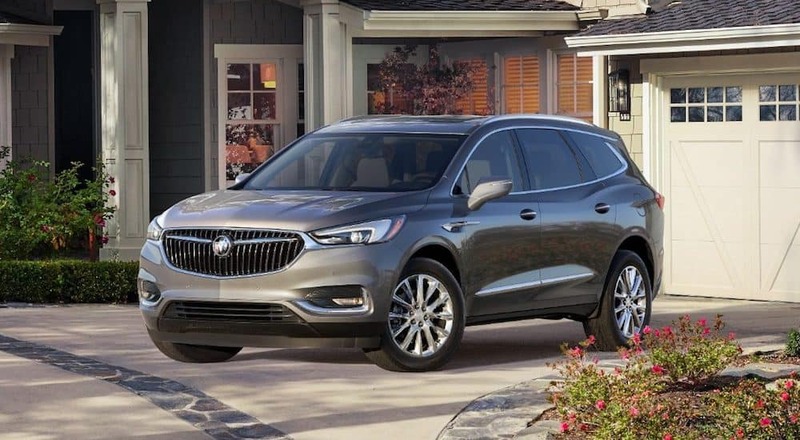 Starting at only $40,000, the 2019 Buick Enclave is significantly more affordable than any other luxury mid-sized SUV in its class, coming in well below the MSRP of competitors such as Audi, Acura, Lexus and BMW. The 2019 Buick Enclave offers the same luxury, elegance and style of other high-end automakers without the hefty sticker on it. Of course, these are just a few of the features you can find on the impressive line of Buick SUVs. Some of these are standard, while some will depend on which trim level you select. The good thing about these Buick SUVs is that there are multiple trim levels for each one, and they are all very customizable to fit your specific driving needs. If you like what you see here, just wait until you see these luxury SUVs in chrome and leather. We invite you to come over to Carl Black Chevrolet Buick GMC in Kennesaw and see them all in person. Our sales staff will be happy to show you each of these and answer any and all questions you might have about them. Our sales professionals are highly knowledgeable and know the ins and outs of all of our many vehicles, including these beautiful Buick SUVs. Our finance team can help you get set up with an affordable payment plan to get you into whichever of the Buick SUVs best fits your lifestyle needs. Our service department can set you up with a regular maintenance schedule, in order to keep your Buick SUV running at optimal condition for years to come. Regardless of which of these Buick SUVs you decide on, we are confident you will be beyond happy with its style and performance. But first, you have to come down to Carl Black Chevrolet Buick GMC and check them out in person. We can’t wait to get you into a new Buick SUV.